You are going to Watch Naruto Shippuden Episode 349 English subbed online free episodes with HQ / high quality. 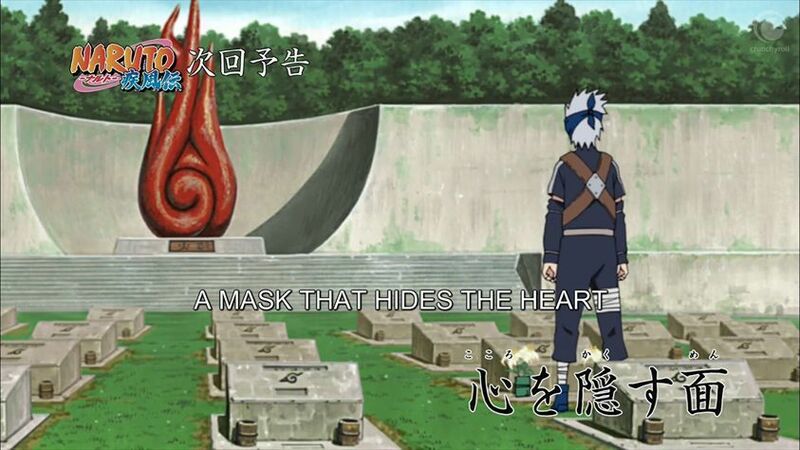 Stream Anime Naruto Shippuden Episode 349 Online English sub A Mask That Hides The Heart. Since Rin’s death, Kakashi suffered nightmares from the ordeal and became withdrawn and sullen. With the end of the Third Great Ninja War, the Ino-Shika-Chō trio are sent on a mission to deliver a treaty to the Hidden Stone. However, the exchange almost turns into an altercation until the Fourth Kazekage intervenes. The treaty is brought before Onoki and his council who discuss the future now that the war is over. Back in Konoha, Hiruzen discusses the village’s future to the Leaf Council and his decision to step down as Hokage so his successor can usher in a new era for their village.